This modern looking Commode Chair is constructed from a strong, natural Hardwood frame and and adds a touch of grandeur to your room. Underneath the easily removed seat, you will find a hygienic, plastic built inner tray, which is detachable as standard. The pan also comes with a sealed lid and easy to grab handles for easy disposal. Furthermore, this chair features wide, extended arms, which provide both comfort when sitting in the chair, and support when rising out of the seat. 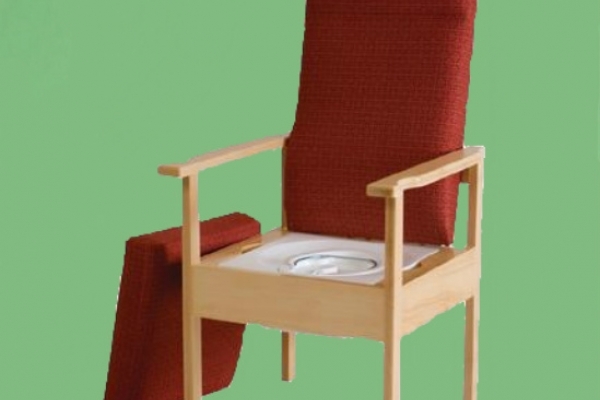 This Commode can be manufactured with both a high and low back. Arm pads can be fitted as an extra.